Any idea what bulletproof coffee is? No? Neither did we; until we met Katie from Crossfit Lutterworth. Recently relocated to a larger and more awesome gym, Crossfit Lutterworth is for anyone. Whether you are a seasoned athlete, beginner or recovering from an injury, they will help and support you to reach your own goals in a motivated and enthusiastic way. The larger premises is complete with a kid’s corner, chill out area, coffee bar and they even sell their own branded work out wear! If you are peckish, treat yourself to something tasty from their menu of healthy snacks, nutritious meals and hot drinks. The chimps were exhausted just by watching a session, so we turned our attention back to what we do best; coffee. Crossfit Lutterworth brews up our very own freshly roasted speciality coffee through a filter. Not only has this coffee been hand-roasted lovingly by ourselves, it is also a special blend that you can find nowhere else. That’s right folks, Katie and her team have created their own custom blend! This blend works awesomely with the bulletproof coffee they make on site too. Consisting of freshly roasted filter coffee, unsalted butter and coconut oil, the science behind this concoction is fascinating. For instance, the coconut oil contains medium chain triglycerides which provide a clean form of energy that lasts for hours. In addition, the butter contains omega-3 and butyrate. This is a type of fatty acid that helps to keep you full for longer. And lastly, the caffeine combines with the natural fat and releases slowly resulting in an energy boost that lasts for a longer period of time. The bulletproof coffee is combined in a blender onsite, allowing you to add as much or as little of the three ingredients to suit your own style and taste. Consequently, the trick to bulletproof coffee is to start with smaller amounts and increase as time moves on. We shall do some digging, and hopefully the team might share their recipe for bulletproof coffee – watch this space! 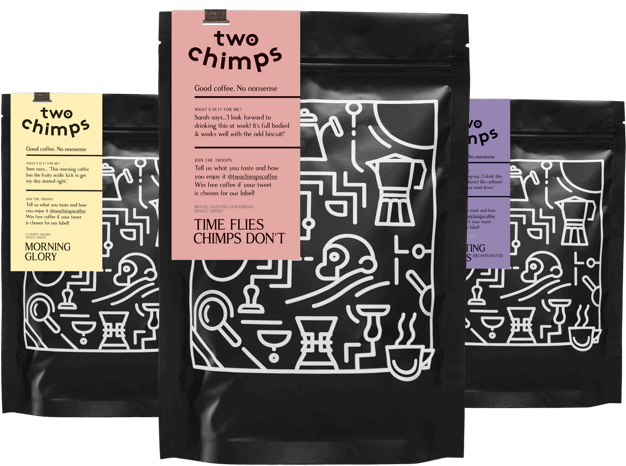 Want to know where else can you find yourselves a cup of Two Chimps Coffee?